What control panel does InMotion use? 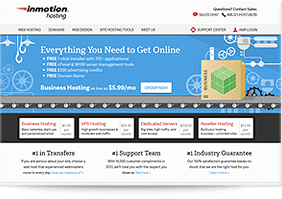 InMotion uses the powerful, feature rich yet user-friendly cPanel as the control panel for all their hosting accounts. The cPanel is a Linux-based web hosting panel that is designed to provide a graphical interface and automation tools for the purpose of simplifying the website hosting process. As such, with the cPanel, you can do a lot of things that has to do with your website such as creating email addresses, modifying DNS records, uploading files and a lot more, except anything that has to do with the billing process. Account management tasks such as managing your databases, file editing, account backups, viewing your website’s statistics and adding add-on domains are made easier and simpler with the cPanel. It is important to note that cPanel is different and separate from your Account Management Panel. While the cPanel is used for the task of managing your account, the AMP handles the administrative functions of your account such as the billing information, changing of your credit card details and ordering new domains and applications. How can I login to my cPanel? Basically, there are two ways of logging-in to your cPanel. One is through the browser address bar and the other is through the AMP. Let us discuss each individually. Next, under your account name, look for the cPanel button and click it. Clicking the button will have you automatically redirected and logged into your cPanel. However, if you are not automatically redirected to your cPanel, you will be presented Login page where your username is already auto-filled. You need to type your password to be logged in. But if you forgot your password, you can update it by clicking the Reset Password button. First, you need to visit the webpage by visiting the following URL, “YourDomain.com/cpanel”, “YourDomain.com” being your actual domain name. So, as an example your domain name is “snaalumni.com”, you visit the site with the URL “snaalumni.com/cpanel”. On the site, you will be asked to provide your cPanel username and password. These details can be found in the technical details in your AMP. What if I forget my password, can I still access my cPanel? You do not need to worry even if you happen to forget your password as you can still access your cPanel. All you need to do is to reset it through your Account Management Panel. However, it is vital to remember that only Shared Hosting cPanel account passwords can be changed through AMP. Dedicated Hosting and Shared Hosting cPanel account passwords can only be reset with the assistance of InMotion’s Support Team. Next, click the cPanel button. Typically, you will be automatically logged into the cPanel if your cPanel password is the same as your AMP password. However, it that is not the case and if you happen to forget your cPanel password, you may reset it by clicking the Reset Password link. As soon as the Reset Password page has loaded, you will be asked to fill-in your new password twice. What can I find in my cPanel? In your cPanel, you can find everything that you need for your website management tasks. You may be a bit overwhelmed at first at the number of icons and other information that can be found especially if it is the first time you logged in and the first time you tried to work with cPanel. First and foremost, divide the panel into two, the left panel and the right panel. On the left side of the panel, you will find all your website statistics. This should show general information such as your Disk Space, what server are you on, how many email accounts you have, how many database you have, what is your IP address and a lot more. This information will change according to the modifications you make to your account. On the right side of the panel are features that you have control over. It is categorized according to sections with each own section header. Usually, most commonly used sections are Mail, Files and Databases sections.